Tropical Cyclone Cilida appeared as a large and powerful hurricane on imagery from NASA-NOAA’s Suomi NPP satellite on Dec. 21. Cilida is located north of the island of Mauritius in the Southern Indian Ocean. Mauritius has posted warnings for the approaching storm. 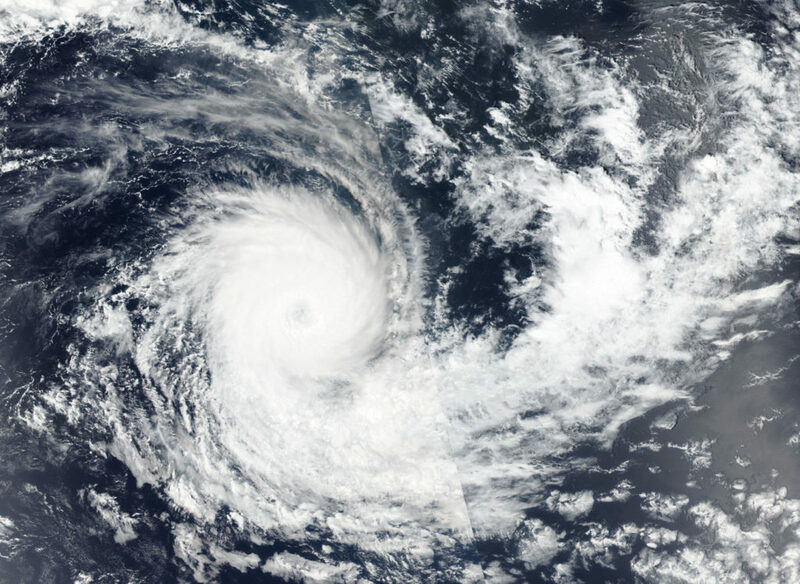 A tropical cyclone warning Class 2 is in force in Mauritius, and a class 1 warning in Rodrigues. Suomi NPP passed over Cilida on Dec. 21 and the VIIRS instrument provided a visible image. 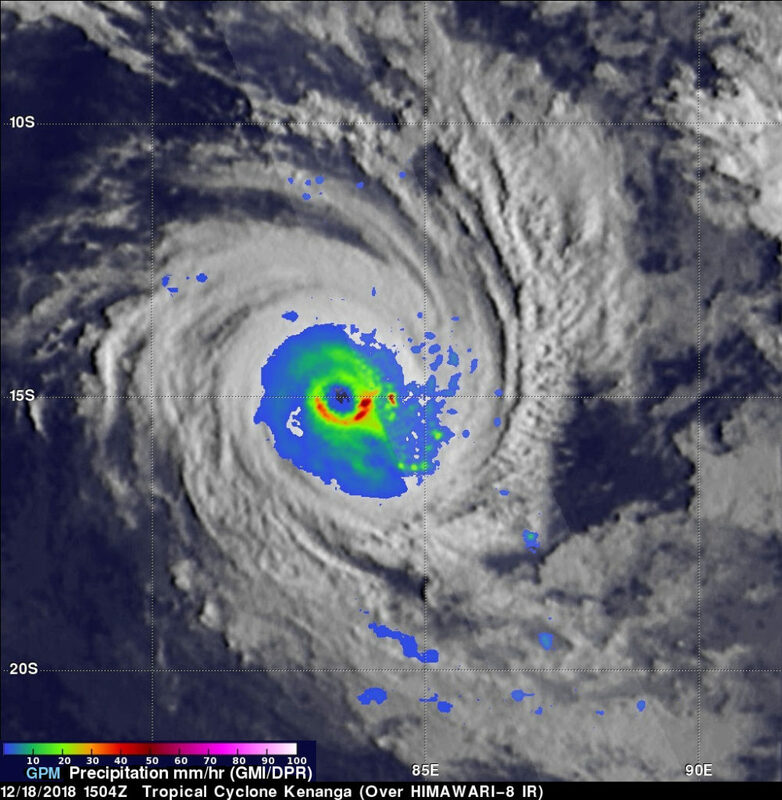 The VIIRS image showed Cilida continued to intensify rapidly. The VIIRS image showed an eye surrounded by powerful storms. The Joint Typhoon Warning Center or JTWC noted, satellite imagery shows the system continued to rapidly intensify as it maintained a 10 nautical mile wide eye and rain bands that wrapped tightly into the center. 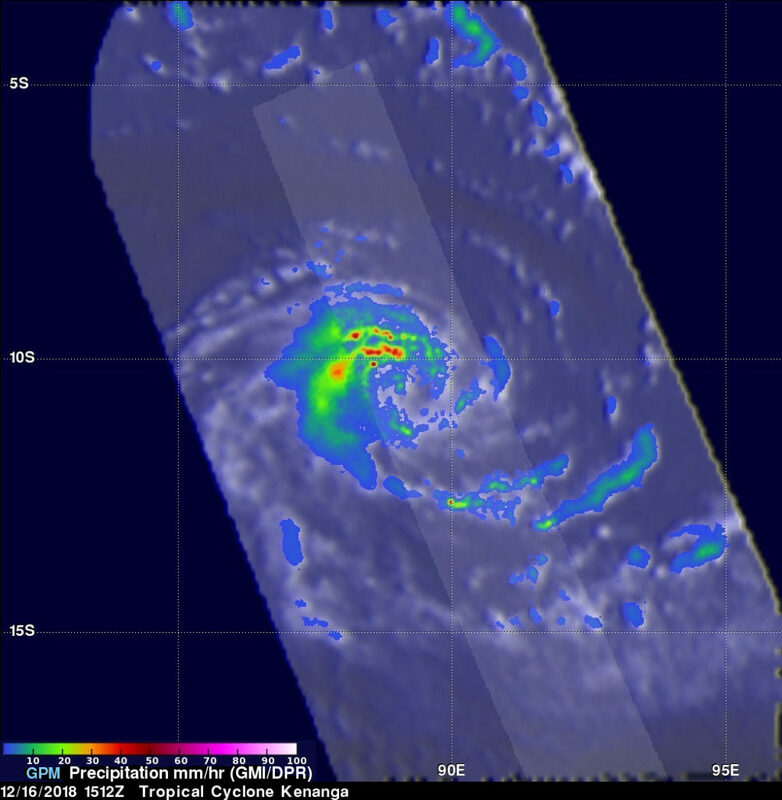 At 10 a.m. EDT (1500 UTC) Tropical Cyclone Cilida was located near 15.1 degrees south latitude and 57.7 degrees east longitude. That’s about 301 nautical miles north of Port Louis, Mauritius. Cilida is moving to the south-southwest and has maximum sustained winds near 135 knots (155 mph/250 kph). Cilida is a Category 4 hurricane on the Saffir-Simpson Hurricane Wind Scale. JTWC forecasters expect Cilida will move south, later southeast as it strengthens to 140 knots after today. Peak intensity will occur as the storm passes between Mauritius and Rodrigues Island. In four days, the storm should transition into an extra-tropical cyclone and rapidly weaken. 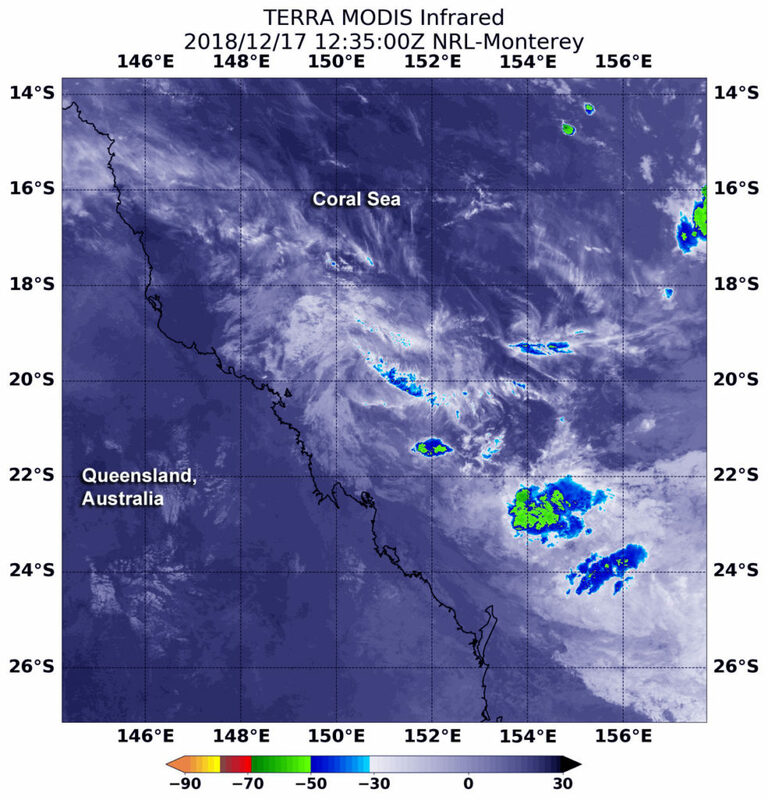 Tropical Cyclone Cilida appeared much more organized on satellite imagery as it moved across the southwestern Indian Ocean and continued to rapidly intensify. NASA-NOAA’s Suomi NPP satellite captured a visible image of Cilida that showed a cloud-covered eye. 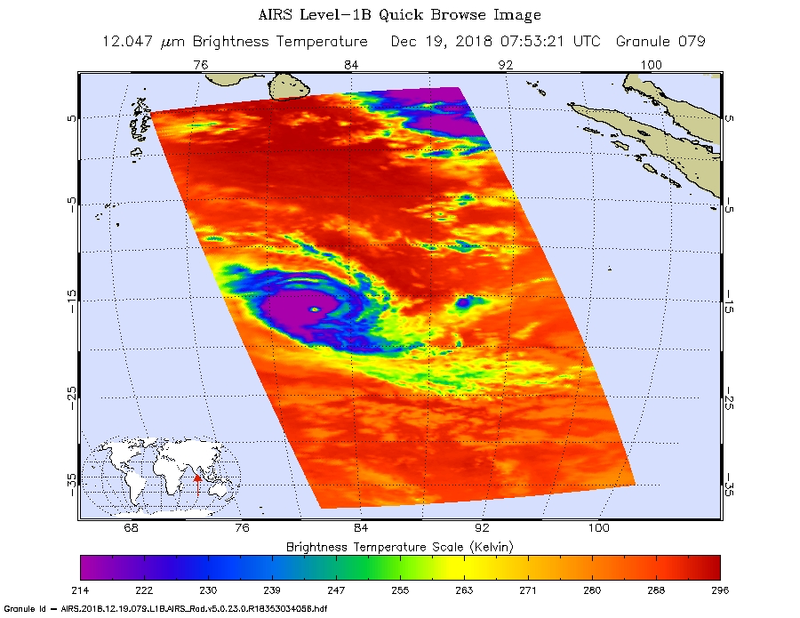 On Dec. 20, 2018 the Visible Infrared Imaging Radiometer Suite (VIIRS) instrument aboard NASA-NOAA’s Suomi NPP satellite showed a powerful thunderstorms circling Cilida’s 18 nautical mile wide eye and extending in bands northwest and southeast of the center. 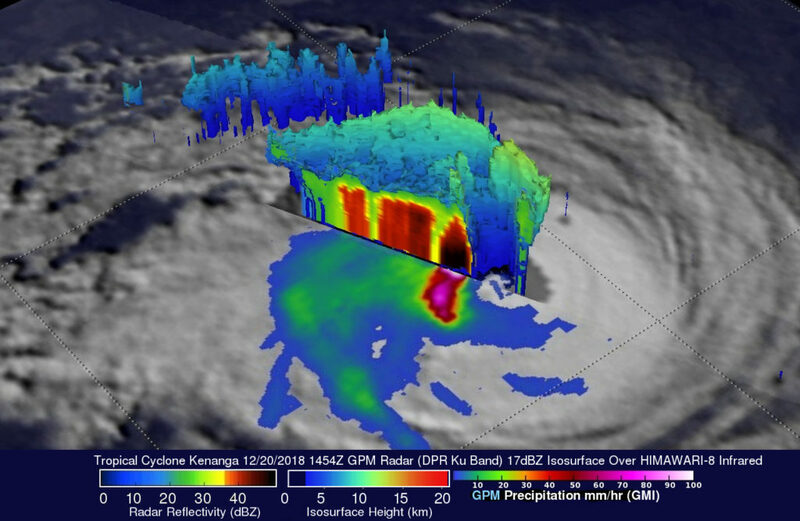 The VIIRS imagery revealed a cloud-covered eye as the storm reached hurricane-strength. The Joint Typhoon Warning Center noted that Cilida had intensified rapidly, by 55 knots (63 mph/102 kph) in 24 hours. Rapid intensification is expected to continue in the near term as warm sea surface temperatures and light outside winds remain. However, Cilida is expected to run into increasing vertical wind shear (which can weaken a storm) ahead of a developing mid-latitude trough or elongated area of low pressure. On Dec. 20 at 10 a.m. EDT (1500 UTC) Cilida’s maximum sustained winds had reached 90 knots (103.6 mph/166.7 kph). Cilida is currently a Category 2 hurricane on the Saffir-Simpson Hurricane Wind Scale. It was located near 13.4 degrees south latitude and 58.9 degrees east longitude, approximately 427 nautical miles north-northeast of Port Louis, Mauritius. Cilida was moving southwestward and was undergoing rapid intensification. Cilida is expected to pass to the east of Mauritius over Dec. 22 and 23 as it curves toward the southeast. In three to five days, Cilida is expected to undergo extratropical transition as it merges with the trough of low pressure. 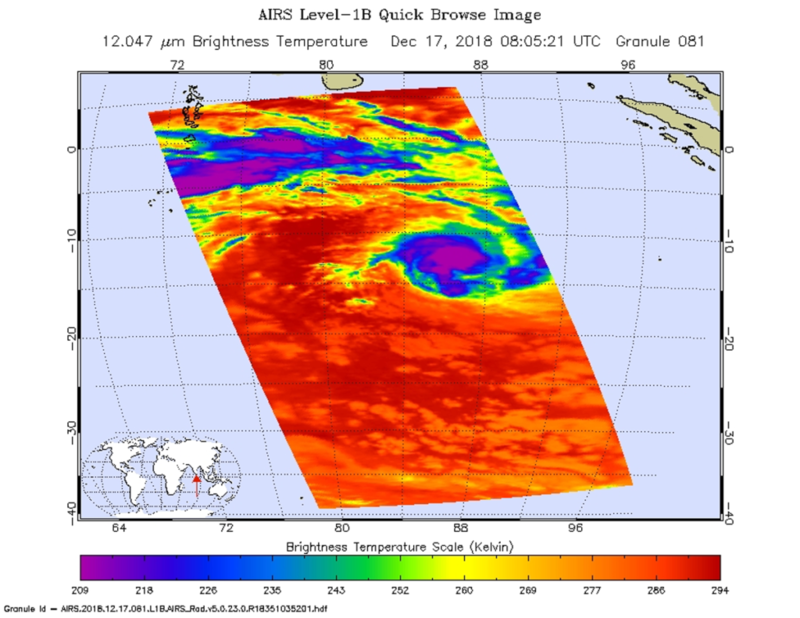 An infrared look by NASA’s Aqua satellite revealed where the strongest storms were located within recently formed Tropical Cyclone Cilida. 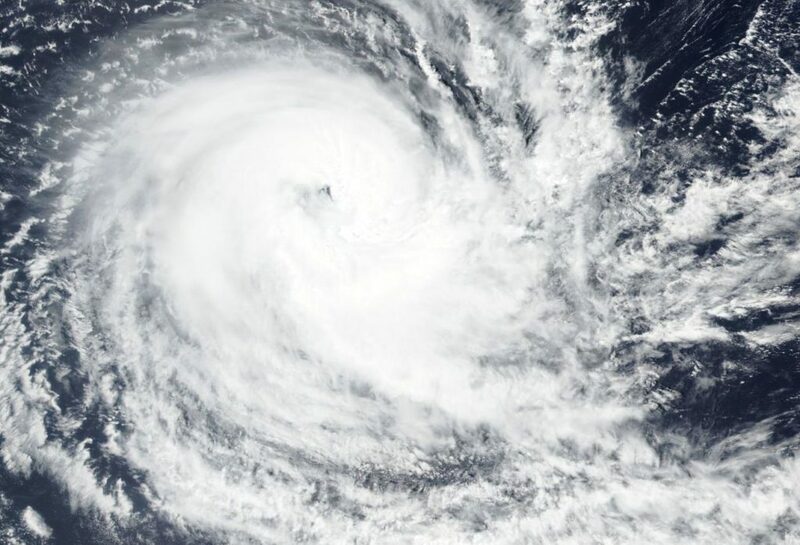 Cilida formed in the Southern Indian Ocean on Dec. 18. 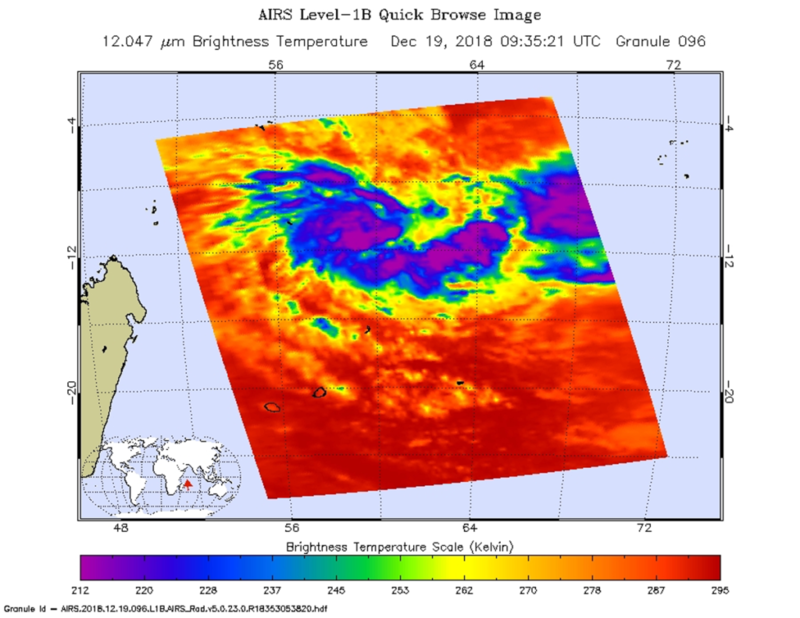 On Dec. 19 at 4:35 a.m. EDT (0935 UTC) the Atmospheric Infrared Sounder or AIRS instrument aboard NASA’s Aqua satellite analyzed cloud top temperatures of Tropical Cyclone Cilida in infrared light. AIRS found cloud top temperatures of strongest thunderstorms were south of the center. Coldest temperatures were as cold as or colder than minus 63 degrees Fahrenheit (minus 53 degrees Celsius). Cloud top temperatures that cold indicate strong storms that have the capability to create heavy rain. On Dec. 19 at 10 a.m. EST (1500 UTC), the center of Tropical Cyclone Cilida was located near latitude 11.6 degrees south and longitude 60.6 degrees east. That’s about 544 nautical miles north-northeast of Port Louis, Mauritius. Cilida is moving to the south-southwest. Maximum sustained winds were near 35 knots (40 mph/65 kph). Threatened landmasses include St. Brandon, Mauritius, and Rodrigues Island as Cilida is forecast to move southwest, and later southeast as it strengthens to 95 knots (109 mph/175 kph) after 4 days. 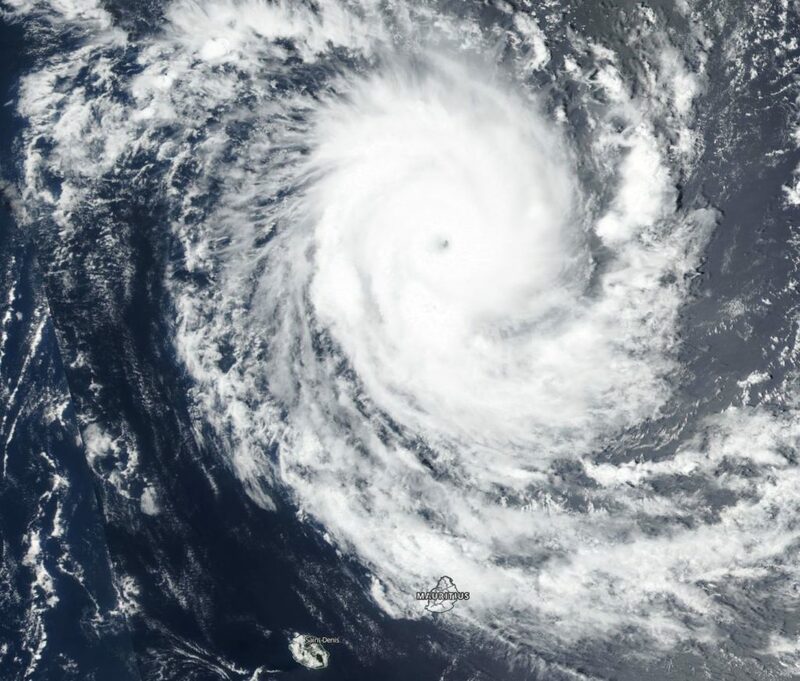 The Joint Typhoon Warning Center expects Cilida to pass to the east of Mauritius on Dec. 22. 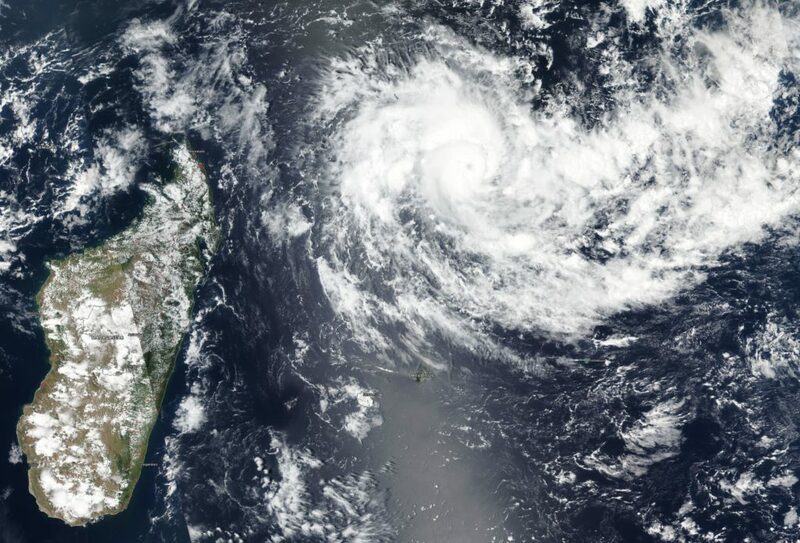 NASA’s Aqua satellite passed over the Northwestern Indian Ocean and captured a visible image of Tropical Depression Phethai after it made landfall in southeastern India. Phethai developed on Dec. 15 as tropical cyclone 08B, about 450 miles south-southeast of Visakhapatnam, India. Phethai made landfall early on Dec. 17 south of the city of Visakhapatnam, in the Indian state of Andhra Pradesh, on the Bay of Bengal. 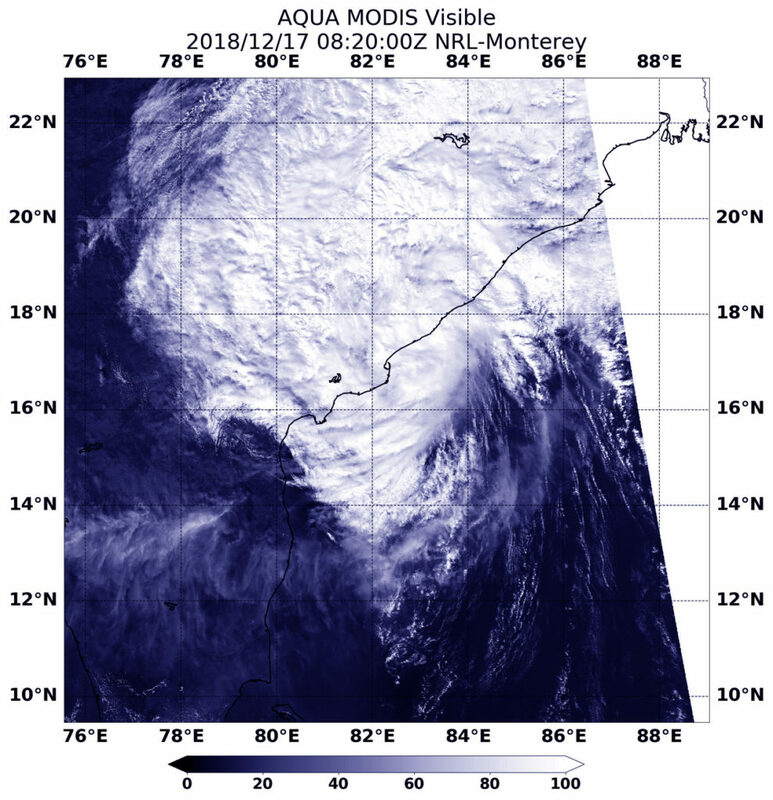 On Dec. 17 at 3:20 a.m. EST (0820 UTC) the MODIS instrument aboard NASA’s Aqua satellite looked at Tropical Depression Phethai after it made landfall south of Visakhapatnam. Satellite imagery showed that the bulk of clouds and showers were north and east of the center of circulation indicating that wind shear was affecting the storm. On Dec. 17 at 10 a.m. EST (1500 UTC) the Joint Typhoon Warning Center noted that Phethai had maximum sustained winds near 30 knots (34.5 mph/55.5 kph). It was centered near 17.7 degrees north latitude and 82.4 east longitude, about 65 nautical miles west-southwest of Visakhapatnam, India. Phethai has tracked northward. Phethai is forecast to move on a north-northeasterly track over land and rapidly weaken.